Rhode Island is the perfect summer New England destination; with plentiful shoreline, stunning mansions, and a plethora of outdoor activities, this is an excellent place to spend a July weekend. However, our lovely little state is a perfect place to visit regardless of season. Yes, that also includes winter. While some tourists may hesitate at the thought of visiting New England in the midst of winter, Rhode Island provides a surprisingly good time, even in the dark, cold months of January and February. Below, we’ve included our favorite Rhode Island-centric winter activities—perfect for residents and visitors alike. 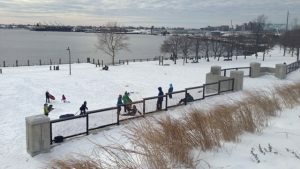 Providence’s India Point Park, Photo from WPRI, Ted Nesi. Go sledding. Rhode Island may not have the mountains of nearby New York, Massachusetts, and Connecticut, but it sure has plenty of hills. Diamond Hill State Park, located in Cumberland, Rhode Island, has an excellent hill and indoor visitor center, perfect for a day outside. This park was once used for skiing, and you might even see some of the abandoned chairlift equipment as you zoom by. Visit the Providence Athenaeum. The Athenaeum is, without a doubt, Rhode Island’s most beautiful library. Featuring robust children’s, general, and special book collections, this place will make a book-lover out of anyone who steps through its doors. In addition to hosting a seemingly endless collection of books, the Athenaeum also hosts readings and events throughout the year. Visit a winter farmers’ market. Rhode Island takes its farmers’ markets seriously, even in the winter. 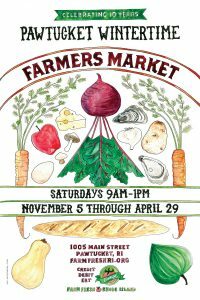 Though you may not see as much fresh produce as usual, the Winter Farmers’ Market at the Hope Artiste Village is a great way to stock up on local eggs, cheeses, meats, seafood, herbs, and vegetables. With plenty of ready-made items, you can comfortably snack while chatting with local vendors. Photo from Pawtucket Winter Farmers Market. Blackstone Valley Train Depot Polar Express. Take a ride on The Polar Express. Every year, the Blackstone Valley Train Depot in Woonsocket, RI transforms its station and train into a remarkably believable replica of the famous Polar Express. Families will spend three hours around the station and living out the narrative of the beloved holiday book. A ninety-minute train ride complete with hot chocolate and candy is enough to make any visitor enjoy winter in this wonderful state. Drink hot cocoa with a friend. 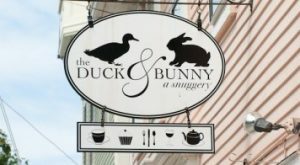 This one might seem a bit obvious, but if you’ve ever visited Duck and Bunny in Providence, you understand out inclination to include this one. A self-proclaimed “Snuggery,” this cozy, comfortable restaurant serves specialty hot chocolate, crepes, and gourmet cupcakes. Stop in for afternoon tea for a truly special winter day.